Communities can forge their own path to achieve a broad range of benefits from renewable electricity and efficiency by setting clear goals at the outset. Across the country cities are setting 100 percent renewable electricity goals. Is that the right goal for every community? It depends. For some communities, setting such a renewable electricity goal may be at odds with what a community actually wants to achieve. To clarify, this article is about electricity goals, not energy. Real quick: electricity refers to energy sources that generate, well, electricity. While energy includes electricity, as well as natural gas for heating and industrial processes, and fuel that powers our vehicles. Energy can be thermal mass, biogas, passive solar heating, and more. The point is that “energy” is very broad and setting a 100 percent renewable energy goal is a very different thing from setting a 100 percent renewable electricity goal. Perhaps the biggest driver of strong renewable electricity goals is the desire to reduce carbon emissions. Of course, it is not the only motivation and there are many co-benefits that can be realized by increasing renewable electricity. Yet, depending on how goals are set, they can end up limiting a community’s ability to achieve the actual goals they want to pursue. Communities should set goals that align with their priorities, are proportionate to the availability of clean energy sources and efficiency opportunities, and recognize the limitations and possibilities given the local regulatory context. Communities may prioritize a range of benefits, from environmental benefits such as reduced impact on climate change and cleaner air and water, to economic benefits such as job creation and money saved on electricity bills. There may also be qualitative benefits, such as being able to say that 100 percent of electricity generation comes from renewable sources, that may or may not impact a community’s priorities. It is helpful for communities to organize priorities to lay out exactly why an electricity goal is being set and what the desired benefits are, and to be intentional about what is to be achieved. Sticking to selected priorities will help define goals to have the greatest impact and avoid goals that limit what can be done. For those concerned with carbon emissions, complete a community energy profile (before setting goals) to understand how all energy is used in the city to see how electricity fits into the larger context. Community-wide energy use includes energy used in buildings, industrial processes, and for transportation. 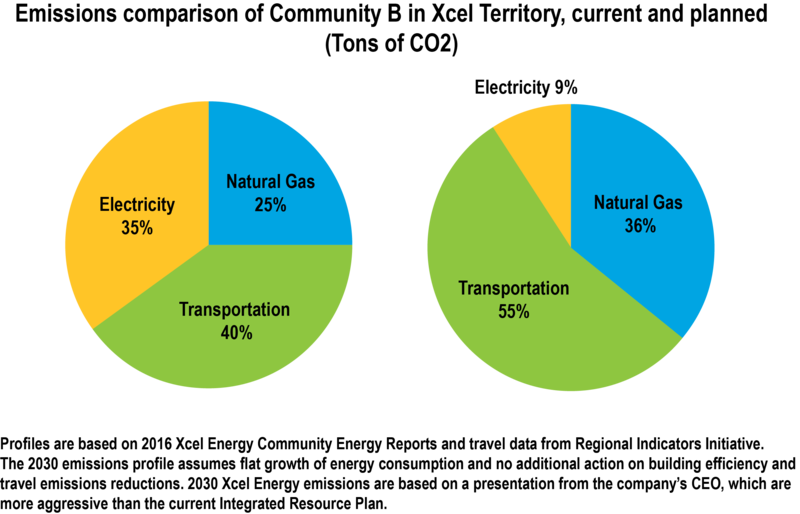 An energy use profile with associated GHG emissions illustrates how GHG emissions from electricity compare to other forms of energy. This information can be used to compare energy use by sector, and emissions by energy type and consumption. Cities will have different energy use profiles and therefore may set different goals that are weighted by the balance of emissions. Figure 1 shows the energy profiles of two different city types. City A is a rural, regional economic center with heavy industry and a greater share of emissions come from the commercial sector as compared to residential and transportation. 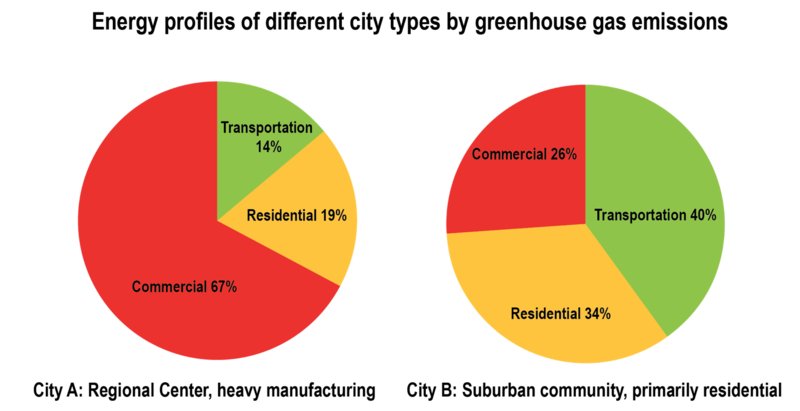 City B is a suburban community where the emissions come primarily from the residential and transportation sectors. Figure 1: City energy profile comparison. Setting goals in City A may look a bit different from the goals set in City B. Each city will probably want to reduce emissions in all sectors, but City A may want to more deeply engage its commercial and industrial business owners while City B would need to focus on residents’ homes and the vehicles they drive – much of which may be met with efficiency and renewable electricity strategies. Once the energy profile is complete, identify the renewable electricity resources that are available in the community and how they compare to electricity consumption. All cities have clean energy resources, from efficiency to local renewable energy opportunities, that are underutilized and waiting to be deployed. Many communities have a rooftop solar resource equivalent to 40 percent to 70 percent of the community’s electricity consumption. Solar installations are not limited to rooftop applications; ground-mount systems can greatly increase the resource but need to be considered in the context of local land use and vegetation. 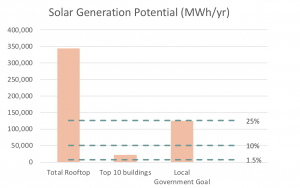 Figure 2: Local government solar goal calculator. 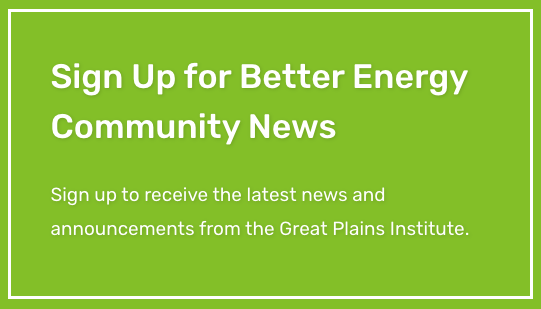 The Great Plains Institute has developed a solar calculator to help communities set rooftop solar goals based on the available resource relative to consumption. Users can set an in-boundary goal to see how much of the solar resource would be needed to meet that goal. A city’s efficiency resource is measured by electricity use — the potential for saving energy is based on electricity used. Energy efficiency is critical to any renewable electricity goal. By reducing the amount of electricity that is consumed, renewable electricity can cover a greater share of electricity used. Electricity from wind may be hard for many communities to capture locally in larger urban and suburban communities. A good wind resource requires sustained winds that are greater than 12 mph, which are typically found at tower heights 30 meters and higher. For rural communities with agricultural characteristics, wind may be a good option to meet renewable electricity goals. In Minnesota, the state’s Department of Commerce provides wind speed maps at a 500-meter resolution. This is not refined enough for specific sites, but it can give communities a general sense of where their wind resource is. Biofuels may also be a great resource for communities, but there is little standardized assessment of potential biomass at the community level. Fuel derived from biomass can be used in several processes as a source of renewable electricity as well as other renewable energy types including thermal energy (heat), and renewable gas. Biomass resources include municipal solid waste, landfill gas, wood waste, and agricultural byproducts, food processing residue and other organic waste. There are examples of communities using biofuels, but it is not currently a widespread technology in most of the United States. Increasingly, counties and other regional entities are looking at opportunities to capture this resource. Knowing which renewable resource is available in a community relative to the electricity consumed is important for setting achievable in-boundary goals. 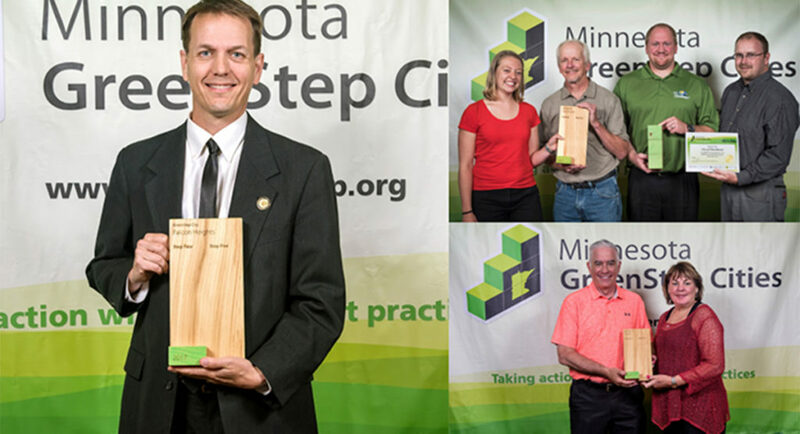 It is these goals that will bring the greatest local economic benefits to your community and are good options for carbon reduction strategies. There are more than 180 electric utilities in Minnesota. The majority are either cooperatives or municipal utilities, with three investor-owned utilities. There is variation in the ability of a city to determine its electricity supply depending upon the type of utility that serves it. 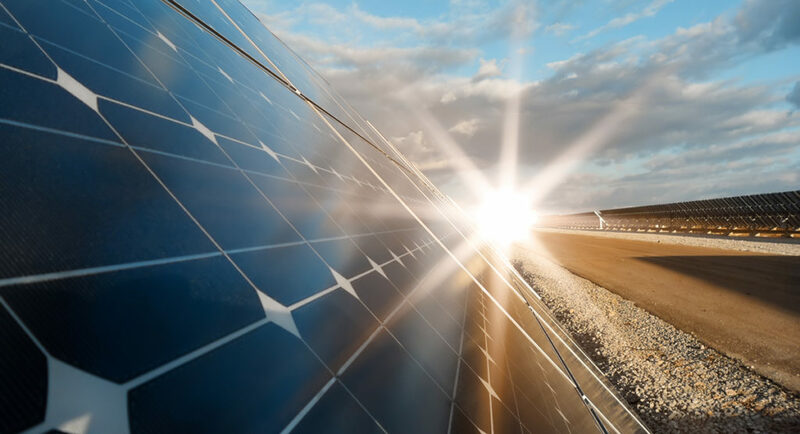 All utilities are required to integrate a minimum level of renewable generation into their portfolio, and many offer more renewable options to customers. Some utilities may have long-term contracts for existing generation or flat load growth that can be barriers to securing electricity from renewable sources. There is variation in utility generation mixes in the state both now and how they are poised to change in the next twelve years or so. 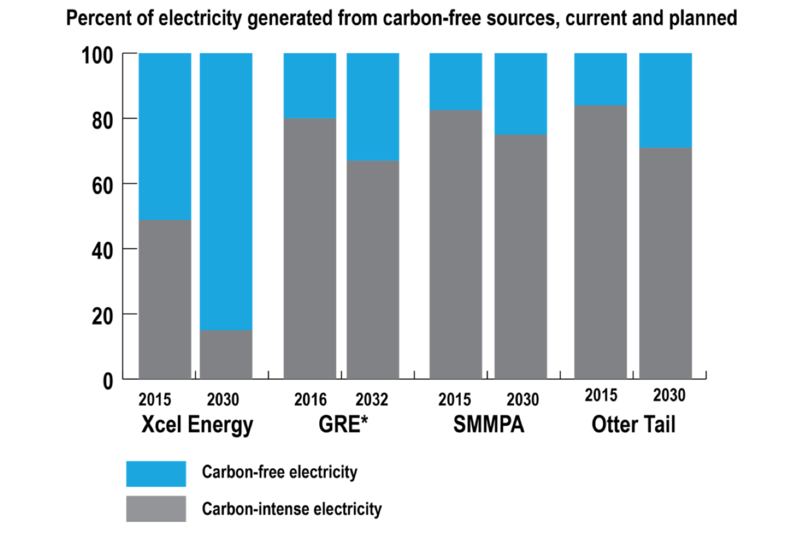 The graph below provides a sample of Minnesota utilities, and it appears that most of the utilities have planned carbon emissions improvement in the years ahead, with Xcel Energy planning for the highest percentage of carbon-free electricity generation in 2030. In 2016, 55 percent of Xcel Energy’s Upper Midwest electricity supply came from carbon-free sources (i.e., renewable and nuclear energy). Xcel is exceeding the state’s renewable energy standard (RES) and has announced plans to receive 85 percent of its electricity from carbon free sources by 2030. Many utilities in the state have achieved the state’s 2015 RES and are on track to achieve 25 percent renewable electricity generation by 2025. Across the state, cities are beginning to pass renewable goals that exceed the state’s RES and are putting pressure on utilities to respond. The generation mix directly impacts a utility’s emissions factor. The emissions factor is tons of CO2 per megawatt-hour (MW-h) and can be used to calculate a community’s emissions based on electricity use. The more zero- and low-carbon energy is in the generation mix, the lower the emissions factor. The chart below shows the emissions factor for each of the utilities that were included in the previous graph. 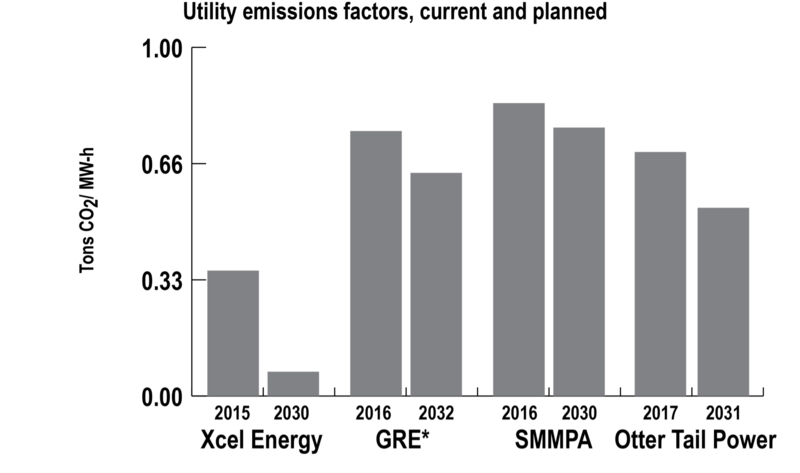 Again, because Xcel has a relatively low-carbon generation mix, it has a significantly lower emissions factor. For example, 100 MW-h of electricity use would result in 360 tons of CO2 in Xcel Energy territory compared to 840 tons of CO2 in communities that purchase from SMMPA. There is a wider disparity in emissions factors looking out to 2030; 100 MW-h in Xcel territory may result in emissions as low as 7 tons per MW-h. The emissions factor has consequences for a community’s energy and emissions profile. Depending on a city’s electric utility, a 100 percent renewable electricity goal may be placing disproportionate emphasis on electricity. Using data from City B in the previous example, the next graph demonstrates how a change in a utility’s emission factor can alter the breakdown of a community’s emissions profile. If the city were to take no climate action and its energy growth remained flat, the proportion of emissions that comes from electricity would be reduced by nearly 75 percent. In consideration of prioritizing emissions reductions, the city may want to set its renewable electricity goal based on the planned emissions rather than the current emissions to be better positioned to put resources toward reducing other sources of emissions. Another consideration under this scenario is how a community chooses to distinguish between renewable electricity and carbon-free electricity. A community in Xcel Energy territory that sets a 100 percent renewable electricity goal may be setting itself back by dismissing existing nuclear generation, which will likely be online through the mid-2030s. Nuclear energy generation can be contentious, but it is nonetheless an important consideration when thinking about low-carbon electricity. Who has the right to claim the renewable electricity is a matter of who owns the renewable electricity credit (REC). In many cases, an individual who owns a solar energy system, for example, may not be able to claim the REC if s/he does not own it. For example, participation in a utility production incentive program likely results in the utility owning the RECs. Similarly, participation in a utility-run community solar garden program will likely also mean that utility owns the RECs, not the subscriber. 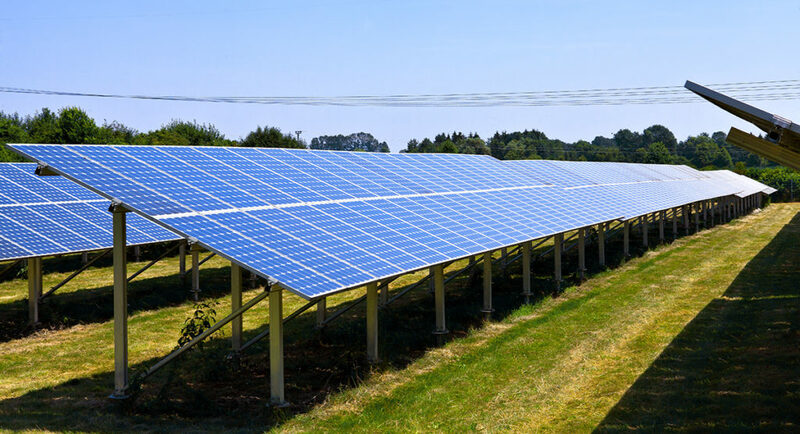 Both distributed solar installations and community solar gardens have direct economic and environmental benefits, though they may not be counted toward a specific renewable electricity goal. Conversely, many utilities offer green power purchase programs where consumers can pay a small premium on their bills to support renewable electricity generation. While purchasing RECs through a green power purchase program supports renewable electricity, it won’t provide local economic benefits and may be limited in its impact on greenhouse gas emissions depending on the renewable resource it is connected with, for instance if the source has already been providing electricity to the grid, the carbon attributes will have already been calculated as part of utility’s emissions factor. Set goals that have the biggest impact on the determined priorities. In-boundary solar and efficiency goals will have the greatest local economic and environmental benefits. To realize these benefits, avoid goals that are tied to REC ownership. 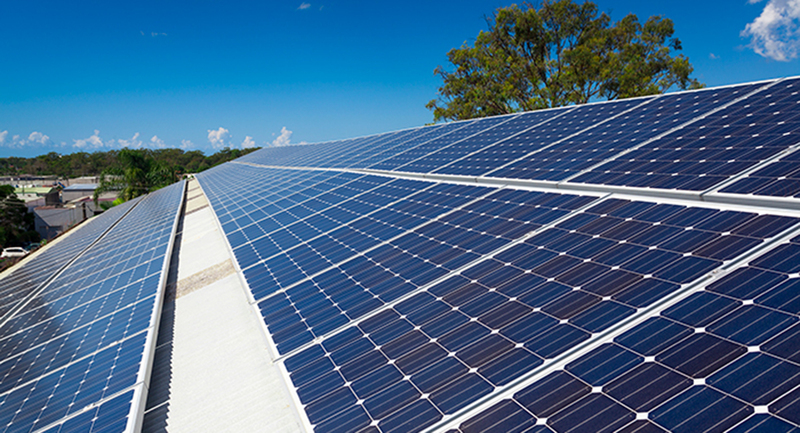 For example, set a goal to install solar on a minimum number of rooftops within the community. Community solar garden subscriptions will also support economic and environmental priorities, though job creation may be realized elsewhere. Set a goal where a minimum percent of residents and businesses are subscribed to a community solar garden. Goals that are set to reduce carbon emissions should consider future generation mixes so strategies can be tailored to maximize impact across sectors. For communities in municipal or cooperative territories, there may be more flexibility in generation sources. Communities can collaborate with the utility to plan a clean energy future that includes a mix of local and remote generation. Many utilities may be limited by long-term generation contracts. There may be opportunity to re-negotiate these contracts or plan the community’s energy vision for when that contract ends. Communities can also leverage efficiency opportunities to support hitting renewable electricity targets and identify the technology or mix of technologies that best fit the community’s available clean energy resources. Whatever goal is set, make sure it fits within the energy and utility context of the community and is in line with the community’s priorities. There is a lot of opportunity to increase the amount of renewable electricity and to reap the economic and environmental benefits locally, so be sure to maximize impact and minimize barriers. Ultimately, cities will carve out a path that works best for them, and the more cities that do, the more everyone benefits from success.